There are times when a player needs the touch of a fine piano without the tone. When the baby is sleeping, children are studying, people are sharing the room, or neighbors need quiet, you want an instrument that offers the natural touch of an acoustic piano, but sound that only you can hear. The solution has arrived! The AnyTime piano is a revolutionary new instrument that combines the capabilities of an acoustic piano and a digital piano. With the AnyTime piano, one can enjoy the pleasing, expressive tone of KAWAI acoustic pianos, with the convenience of powerful, exciting features that can only be found on a digital instrument. 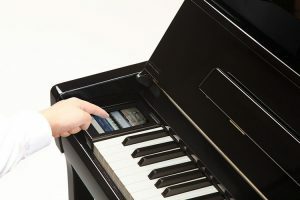 As its name implies, the most compelling aspect of the AnyTime piano is that it can be played at literally any time, without disturbing family or neighbours. It will allow you to enjoy the touch of a fine KAWAI acoustic piano while retaining the privacy and power of built-in digital sound. The AnyTime piano will offer many creative new possibilities for music-making in your home, school, or recording studio. A fine acoustic piano entices musicians to perform with enthusiasm, spontaneity and passion. Yet, the satisfaction that one enjoys when hammers strike the strings is often diluted by traditional piano silencing techniques. 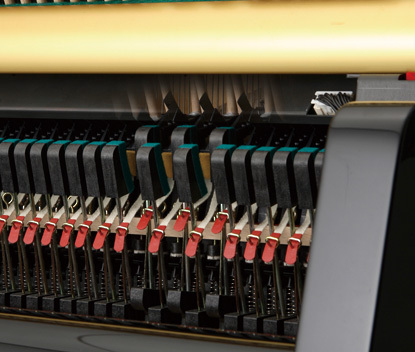 Sensors located below the keyboard struggle to accurately interpret the subtleties of musical expression, which is why AnyTime pianos integrate sensors within the fine workings of the piano action, reading the precise movements of each hammer. Whether performing rapid passages that demand the same key be played repeatedly before returning to its natural starting position, or pianissimo pieces desiring the very softest of key strokes, the Integrated Hammer Sensing System (IHSS) represents the elaborate nuances of every note. Digital operation greatly extends the capabilities of the AnyTime piano beyond that of a traditional acoustic instrument, with convenient transpose and tuning facilities, a metronome and song recorder, and a selection of high fidelity sounds suitable for various musical occasions. (ATX3) The digital capability is distinguished by the effortlessly intuitive touchscreen interface placed to the left of the keys. This screen essentially gives you easy and dynamic access to the same high level technology which is used in the top of the range Kawai digital pianos. 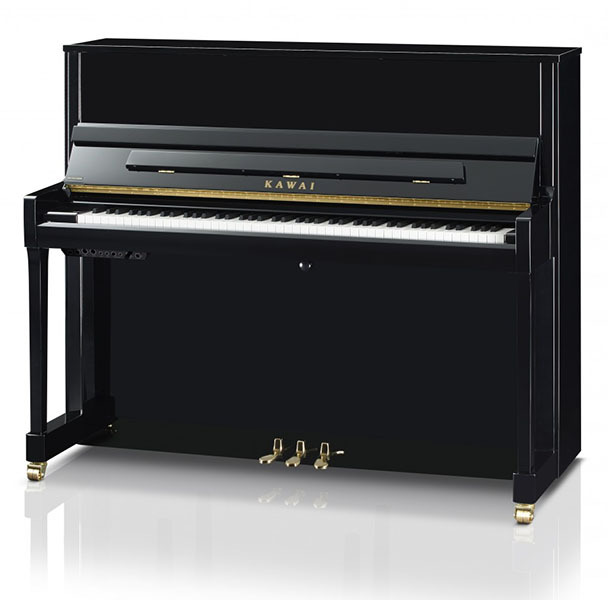 Another important digital feature of this piano is that you are given a high level of connectivity. With integrated Bluetooth®, MIDI and USB functionality, you will be able to link up the instrument to your personal computer or tablet and therefore be able to record straight into any music software you might have loaded onto your device. (ATX2) Dual headphone sockets provide greater flexibility for academic institutions, while other connectors allow a range of creative music-making opportunities. 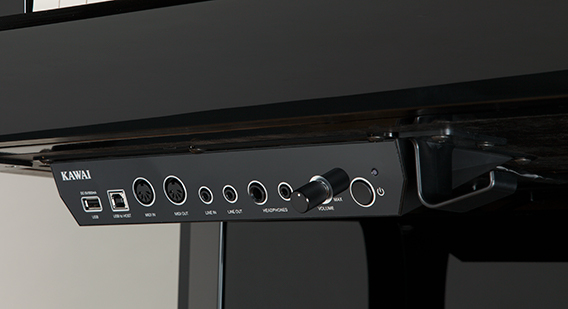 Two headphone jacks (including Line Out) are located beneath the piano, to connect stereo headphones to the AnyTime models for your convenience. Further connecting possibilities include USB and MIDI jacks. (ATX3-specific) In addition to standard MIDI jacks for connecting to other instruments, the AnyTimeX3 models also boast integrated Bluetooth MIDI and Audio technology that allows the instrument to communicate with supported smart devices wirelessly. Digital operation greatly extends the capabilities of the traditional acoustic upright in the K300-ATX3 that is truly the best of both worlds. 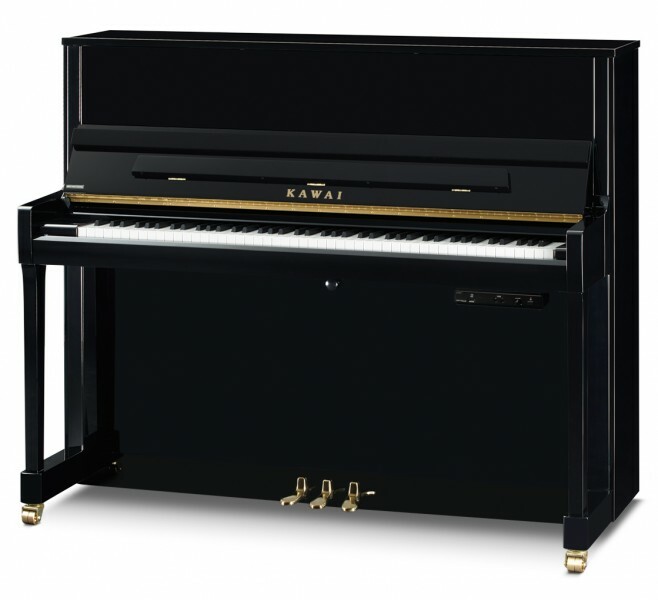 The digital capability is distinguished by the effortlessly intuitive touchscreen placed to the left of the keys, which essentially gives you easy and dynamic access to the same high level technology used in the top of the range Kawai digital pianos. Another important digital feature of this piano is that you are given a high level of connectivity. With integrated Bluetooth ® MIDI and USB functionality, you will be able to link up the instrument to your personal computer or tablet and therefore be able to record straight into any music software you might have loaded onto your device. The K300-ATX2 combines acoustic and digital technologies. 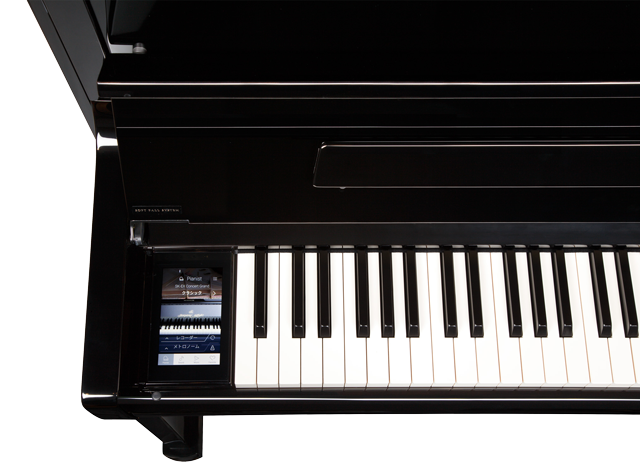 It is a 48″ professional upright piano that is also a full-featured digital piano.